Here's a list of simple changes that you can add to your eco friendly house cleaning routines. These are common-sense tips and tricks that will make your house a chemical-free environment and save you some money along the way. We all know that paper towels are not the best thing for the environment. It is also an added expense we can do without. The best way to eliminate paper towels is to use something that is already around the house, such as washcloths or even old t-shirts. When they get dirty, simply throw them in the wash and they will be ready for the next time. Wash your windows and mirrors and other glass items with products that do not contain ammonia. Many people still use products containing this chemical, which may trigger various respiratory troubles. Even though your windows will look great, the damage that it will cause to your health really is not worth all that sparkle and shine. All you have to do to go green is to use a mixture of lemon juice and water. To make this solution, combine four tablespoons of lemon juice mixed with two litres (half a gallon) of water and pour into a clean spray bottle. 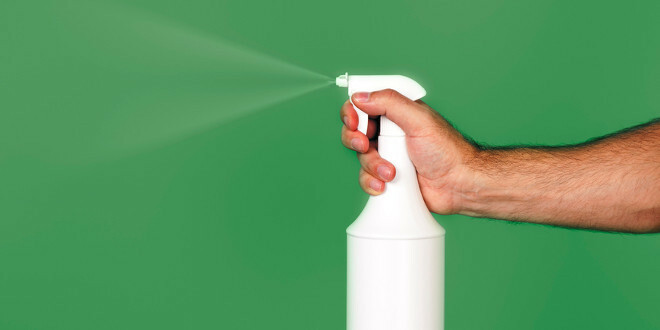 Spray the solution and wipe with a cotton rag (instead of the paper towel) to make your windows and mirrors squeaky clean. To avoid clogged up kitchen and bathroom drains, and having to use chemical cleaners to unplug them, make sure you have use properly fitted drain shields. They are inexpensive and come in various sizes that fit any drain. Once in a while, pour some baking soda and vinegar into the drain to clean the gunk that might be forming in the pipes. Vinegar and baking soda are both harmless for the environment, dissolve easily and wash away naturally. Cleaning the oven can be a challenging task, even when you have a self-cleaning oven. Most people leave the oven dirty for too long and then they attack the layers of dirt with extremely harmful chemicals. Instead, create a paste by combining baking soda and water, coat the oven walls and then let it sit overnight. While the paste is getting harder, the baking soda will start to dissolve dirt and grease stains. The next day simply scrub all the hardened paste away using a soft sponge. If you have hardwood floors, you can make your own cleaning solution by mixing vinegar and olive oil. Depending on the type of hardwood flooring you have, you'll need to do a bit of research to find out which ratio works best for your scenario. Another quite obvious suggestion is adding house plants to your home. You will brighten up the environment and the plants will act as air purifiers while keeping the air fresh. A few types of plants with the best air cleaning properties are spider plants, peace lilies and English ivy. For an 1800 square foot surface, you will want at least a dozen plants scattered around the house. No more need for expensive and harmful air purifiers. Avoid using furniture polish and make your own green polish by combining one part lemon juice to two parts olive oil. Use a soft cloth to rub the mixture onto your furniture. The furniture will look great and also smell much better than any other chemical based furniture polish. Learn to love the fab four: baking soda, vinegar, lemon juice and salt. You can combine these ingredients in many different ways to clean just about anything around the house. There are many recipes you can find for your particular cleaning needs. The green approach is definitely the best for your health, especially when it comes to home cleaning ideas. If you can, start cleaning your house using green cleaning solutions that will make your home chemical free. Try to avoid traditional chemically-based cleaners that are still being advertised everywhere. Start using eco friendly house cleaning products and go green today!